Freshmen file into Beeghly Center for Ignite day earlier this week. This year’s freshman class is the strongest academic class in the university’s history. Youngstown State University opened a new academic year today with increased enrollment, residence halls at capacity and a freshman class that is the strongest academically in the university’s history. 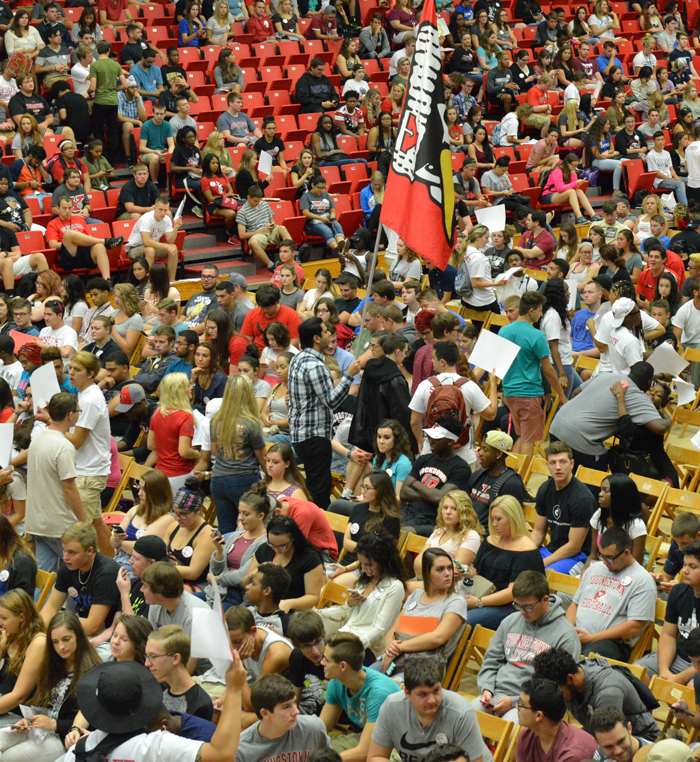 It is YSU’s first Fall-to-Fall enrollment increase since 2010. The incoming freshman class is 6 percent larger than last year and, for the third consecutive year, boasts the highest standardized test scores and high school grade point averages in YSU’s history. All university residence halls, as well at the YSU Courtyard Apartments, are at capacity with 1,278 students, up from 1,154 two years ago. In addition, the new privately-owned and –operated University Edge apartments on Rayen Avenue are filled, with 162 students. 2,193 freshmen enrolled, up 6 percent from last year and 20 percent from 2014. 21.75 average ACT test scores for incoming freshmen, a new high. The scores surpass last year’s 21.19 and the 21.09 in 2014. 3.24 average high school grade point average of incoming freshmen, also a new high. The average is above last year’s 3.14, 3.12 in 2014 and 2.97 in 2013. 245 freshmen in the Honors College, up from 175 last year and 96 in 2014. Freshmen from 23 states, 459 high schools and 51 Ohio counties, up from 16 states, 303 high schools and 37 Ohio counties in 2014. Significant enrollment gains in four of YSU’s five primary service counties, despite overall population declines: Trumbull up 10.5 percent, Columbiana up 52 percent, Mercer County (Pa.) up 12 percent and Lawrence County (Pa.) up 14.71 percent. Mahoning County is down 1.15 percent. Out of state freshmen up 8.6 percent. The number of transfer students and students enrolled in graduate-level classes is also up.